Serving Logan County in their time of grief is a business rich in Logan County history and heritage. Beginning in 1896 The Eichholtz-Smucker Fu-neral Home and Furniture Store originated in West Liberty. Over the next hundred plus years Eichholtz has moved locations multiple times, added partners, merged and bought several other funeral homes within the area all to strengthen and provide exceptional care to their customers. You can now find Eichholtz Funeral Homes in Bellefontaine, West Liberty, Belle Center, Rushsylvania, Lakeview, Jackson Center, and DeGraff. The services available to Eichholtz customers are Funeral Services, Cremation Services, Pre-Arranged Funerals and Monuments. There is a new generation of funeral home directors but with the same Logan County history and dedication to the residents of the area. “We chose to continue the long-standing tradition of serv-ing the families of Logan and surrounding counties because Logan County has been home to most all of our staff our entire lives,” says Trey Daring. 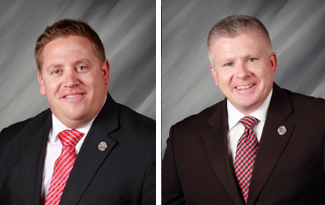 Since Trey & Dennis became partners of Eichholtz Daring & Sanford Funeral Homes on June 29, 2012, they have been planning the expansion of their services. “We are very pleased that we will be adding a new division to Eichholtz Daring & Sanford Funeral Homes,” says Daring and Sanford. This new service offering will be in the form of a new cremation facility, which will be a new struc-ture attached to our Bellefontaine funeral home. The new facility will be name Elite Cremation Services and it will be Logan County’s first and only facility designed to serve families choosing cremation as a means of final disposition. This new addition will contain a state-of-the-art crematory system with both a natural gas supply and generator back-up system, making Elite Cremation Services the only crematory that can assure a “no interruption cremation” to the families of Logan and surrounding counties. We anticipate Elite Cremation Services being in operation in June 2015. 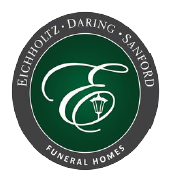 Eichholtz Daring & Sanford Funeral Home is an Exclusive “Cremation With Care” Provider, Partner of the “National Association of Professional Remembrance Planners” and “Veteran’s & Family Memorial Care”. You can find many of the Eichholtz staff throughout the county on any given day or any county wide events. “We try to be active participants in the communities we serve via volunteering, participation and donations,” says Daring. 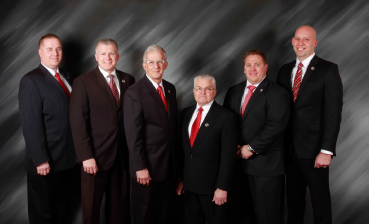 Eichholtz Funeral Homes current directors are Bud Eichholtz, Marvin Hilty, Trey Daring, Dennis Sanford, Eric Tinsman, David Seeley, and Kyle VanHorn (apprentice). Other employees from Eichholtz that play important parts for the business are Office Managers; Karla Haas, Susan O’Rielley and Shirley Sanford. The Director Assistant is Rush Eichholtz, maintenance is John Engle and part-time staff members are Janet Devine, Lee Harbour, Dane Daring, Mike Kerns and Rick Nelson. The importance and presence in the community just comes natural for Eichholtz Daring & Sanford staff. Our primary reason for being a member of the Logan County Chamber of Commerce is to simply support and strengthen local family owned businesses in our county. The chamber is a won-derful resource for the small business owner to have when the need arises. We thank the staff for their 34 years as Logan County Chamber Members and for their care, dedication, and support to the residents of Logan and surrounding counties.